The Stand Comedy Club in Newcastle is set to host a fun panto this December, with some incredible comedic talent involved. 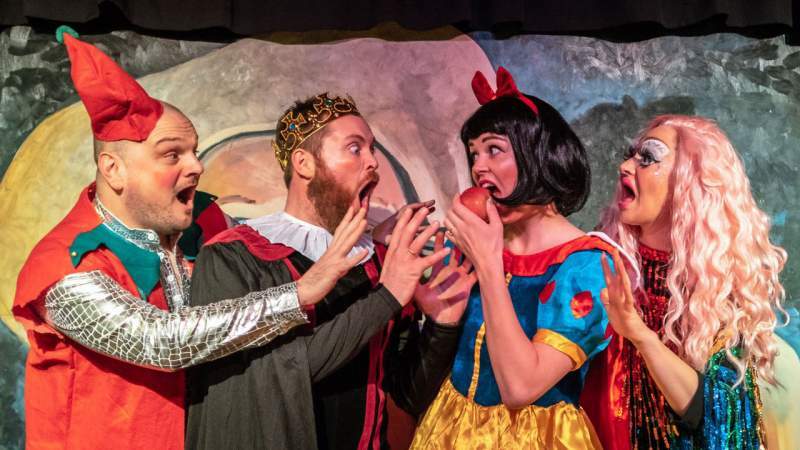 Ahead of the first show on Monday 17th December, we caught up with Snow White (who bears a striking resemblance to actress Hannah Walker) to find out a little bit more about Snow White 2: Appley Ever After. Oh it’s Snow White 2: Appley Ever After, the unofficial sequel to Snow White and it’s bigger and better than the original! It’s the Stand Comedy Club’s first ever pantomime so it’s very exciting for all of us. It’s got songs and dances and silliness (well – not so much by me I might add.) When you last saw me I was marrying a handsome prince. Sadly he left me and I felt terrible, but with the help of my friends Frankie and Muddles, I’m trying to stay positive. Even if that means using Frankie’s own unique stress busting techniques such as throwing a goose at a dart board… or sometimes, and I really shouldn’t say this and please don’t tell anyone, I like to have a long fart to relieve myself of my stresses. Who knows, maybe I’ll find love in Snow White 2? Or maybe I’ll stop caring and realise as long as I have my friends, I’ll be fine. P.S. It’s not a show. It’s my life. Who’s your favourite to work with? Frankie! Of course! That’s the easiest question you could ever ask me. She’s lush. Or he. Sorry, they. This is a hard one, because they can all be rather irritating at times. I’d have to say Muddles, because he always appears at the most awkward moment. He’s a lovely boy, don’t get me wrong but it’s not lovely when he walks in when I am having a wee. Also my evil stepmother, who despite being trapped in a mirror for all eternity, can still be a bit of a pain in the bum. What do you get up to away from being in the show? Show? Just to reiterate, this is a documentary of my life. What do you like about your audiences? I am so broody so I love all the children. Big or small they warm me up when I am feeling cold. What are you hoping to get off Santa this year? A child! Or maybe a new wig, I mean… what? This is my real hair. (don’t print that) .